I'm finally getting around to a few of the recipes that have been hanging around waiting to be experimented with. This one turns out to be a great recipe for both the grill or the oven and can be frozen and pulled out to thaw for even a weeknight meal. I prefer it best on the grill and use bone-in for that. Whisk together chii sauce, white wine, oil, basil and garlic until well blended. Prick each chicken thigh several times with a fork and place in a tupperware marinader or ziploc bag. Pour most of the marinade over chicken pieces. Seal and refrigerate. Refrigerate the remaining marinade for basting during the grill time. Turn frequently for 8 hours or overnight. Place chicken on greased grill rack/pan. Cover with foil and grill 10-15 minutes. Uncover and baste pieces with marinade. Turn pieces and grill another 10-15 minutes until cooked through. DO NOT RECOVER. NOTE: You can also also freeze the ziploc of chicken with 1 1/2 cups of marinade and remaining marinade in a separate small ziploc for future cooking. Just defrost overnight in the refrigerator and cook at dinner time. *I love these frozen herb cubes. With just the two of us fresh herbs go to a huge waste many times so these are a fantastic alternative. 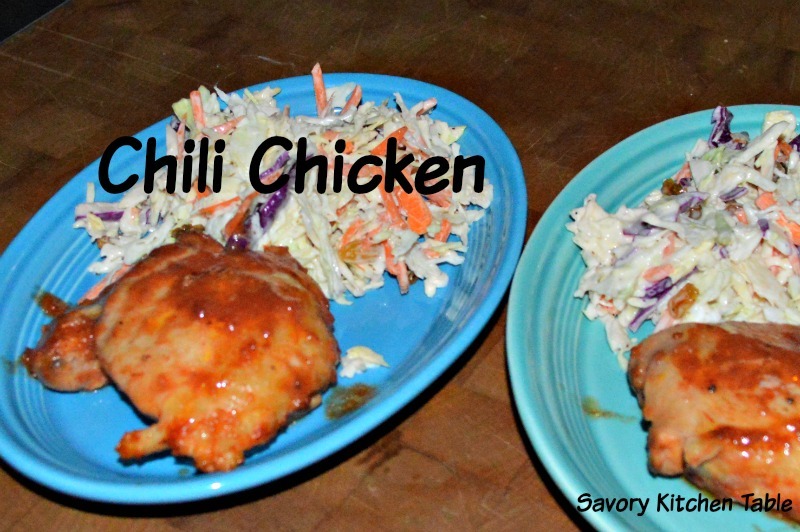 **Original recipe called for bone-in, skin-on thighs, but I changed it and they taste just as good.